Parum Pugna: Granicus - Action Stations! Our action was fought over a table measuring ten feet by seven with the river running diagonally across it starting two feet in from the Persian table edge and ending two feet in from that of the Macedonians. The Granicus – said to be knee deep on the day of the battle - had no effect on cavalry movement but slowed and disrupted the phalanx which fought less effectively while wading through the water. Alexander began the game in column of march. 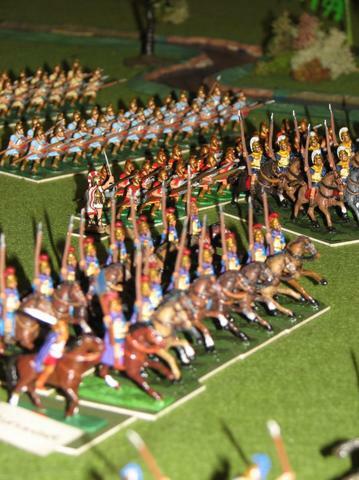 His forces consisted on 6 x 40 fig Phalanx, 3 x 24 fig Hypaspists, 2 x 12 Cretan archers, 2 x 12 Agrianian javelins, 3 x 20 Thracian and other peltasts; 3 x 16 Companion cavalry, 2 x 16 Greek allied cavalry and a 16 figure unit of Thracian prodromoi: a total of 420 infantry and 96 cavalry. Opposing him was a Persian army of 20 x 16 cavalry, 8 x 24 Greek mercenary hoplites and 4 x 12 Greek light troops, a total of 240 infantry and 320 cavalry. The Persian cavalry, a mix of heavy, medium, light and horse archers, lined the river bank, while the hoplites formed up a distance behind them pretty much as in the actual battle. 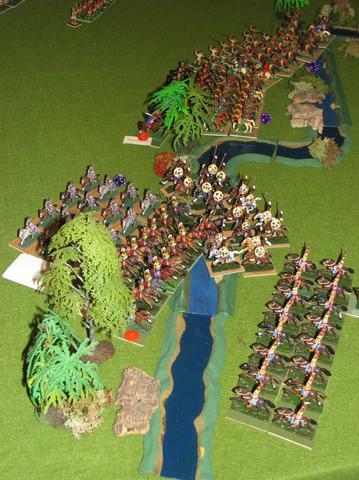 The Persian commanders – myself and Clive Norman – actually found we had too many cavalry to cram in on the ten foot front available and held 4 units back in reserve. The initial moves saw Alexander – Stephen Caddy aided by The Old Metal Detector himself - deploying from column, the Companions taking up a position on the right flank, the prodromoi and light troops scouting ahead of the slowly advancing phalanx and the peltasts screening the phlangites vulnerable left flank. 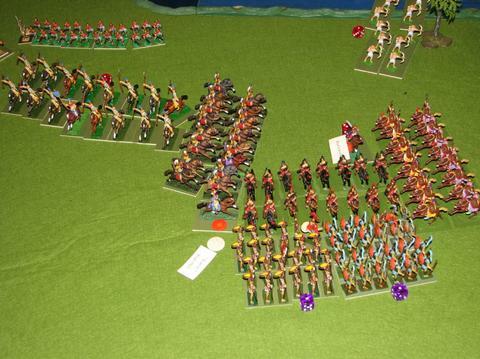 Surprisingly Alexander also opted to send the Greek allied cavalry over to the right to join the Companions. A massive “hook” was clearly the plan. 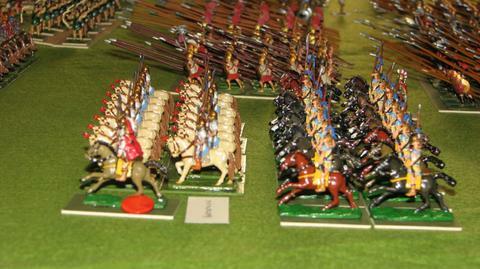 The Persians attempted to disrupt the Macedonian deployment by sending 5 units of horse archers across the river. Those on the Persian left were swiftly dealt with by the Companions but not before a well aimed arrow from one of the Sakae horseman had pierced Philotas, killing him instantly. On the right the horse archers faired altogether better, lurking dangerously and causing gradual but mounting damage to the peltasts and phalanx. The Companions and the Prodromoi quickly reached the Granicus and soon were battering the Persian defenders. Unit after unit of the Great King’s cavalry broke and fled before the onslaught. Arsites was killed in a melee, so too was Spithridates, while Memnon of Rhodes was swept from the field along with his Trodean horsemen. After an hour of fighting it looked indeed as if the end would very soon be in sight for Mithrobarzanes, the last remaining of the Persian nobles. At this point, however, the sweeping success of the Macedonian cavalry drew it into difficulties. Having driven all before them Alexander and the Royal Companions suddenly found themselves isolated from their compatriots. The Persians threw in their cavalry reserves (ie the ones we couldn’t fit in the line) supported by several hoplite units and soon the young king was battling for his life. An attempt by the Prodromoi to come to his rescue ended with them being caught in flank and rear and destroyed. The Royal Companions too eventually disintegrated, but Alexander miraculously survived (every time a unit with a leader attached is hit we turn a playing card – a red picture card results in the leader being killed. During the struggle Alexander turned up a 10 of diamonds, an ace of hearts and an ace of diamonds. As in the real battle the great man seemed to live a charmed existence). 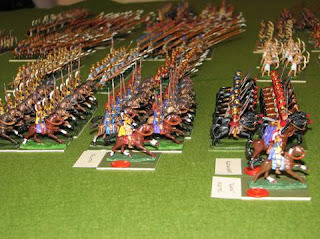 Alone in a mass of swirling Persian cavalry he was rescued by the counter attacking Companions lead by Black Kleitos who threw back the Persian horse and Greek mercenaries. Tragically in saving his king the brave Kleitos himself was killed (though at east that saved him from being skewered by a drunk Alexander later in life). In the same scrimmage Mithrobarzanes too was lost. While all this was going on, in the centre the Macedonian phalanx had at last reached the Granicus where, struggling to get up the slippery banks, it was halted by the javelin fire of a couple of units of Persian light cavalry combined with the continued harassment of the horse archers. Persian medium cavalry had also now crossed to the Macedonian side of the river and - seizing the opportunity presented by Alexander’s decision to deploy all available horseman on the right - had driven off the screening light troops and plunged into the flanks of the phalangites. Three phalanxes were routed in the ensuing fight. The other three stuck grimly to their task however and, as Parmenion arrived with some Thessalian cavalry to engage the marauding Medes, the phalanxes finally hacked their way across the water and up onto dry land. With Alexander now joined by the remaining two regiments of Companions, the Greek allied cavalry and the as yet barely tested Hypaspists the game was almost up for the Persians. 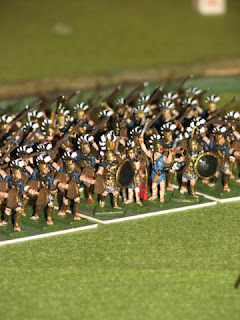 Several mercenary hoplite units had already collapsed in the melee with Kleitos, and with the Phalanx advancing towards those that remained they were outnumbered by over two to one. The remnants of the Persian cavalry, now leaderless. decided to abandon the infantry to their fate and galloped off to the south leaving the field to Alexander. Another bloody and hard fought encounter that lasted for a little over five hours. I was just pushing some off the troops around. It did nearly make me break my lifetime "no ancients" rule - I remember seriously pricing up HaT plastic armies as the quickest way to get them on the table - but in the end sloth and common sense prevailed. Impressive game, though. 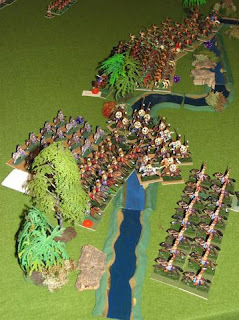 Excellent battle report, this and the previous post. 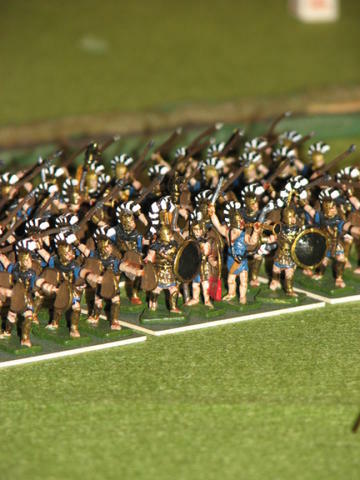 I only wish for larger format images sometimes, all the better to see these impressive armies.